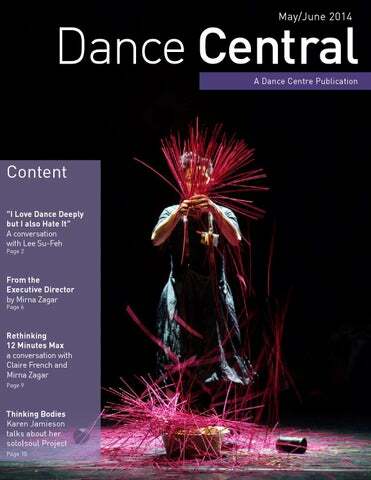 Welcome to the May/June 2014 issue of Dance Central. Su-Feh Lee is a dancer, choreographer, dramaturge and teacher born and raised in Malaysia, where she trained and performed in theatre and dance. Since arriving in Vancouver in 1988, she has created a body of work that interrogates the contemporary body as a site of intersecting and displaced histories and habits. In April 2013, she received the Isadora Award from The Dance Centre for her contribution to the dance field as choreographer, performer, teacher, thinker, writer and speaker, and in March 2014 she received the second Lola Award. She is currently working on building a Dance Machine, with the help of dance artist Justine Chambers and architect Jesse Garlick; and is also participating in Migrant Bodies, a two-year international research project hosted by The Dance Centre and partner organizations in Montreal, France, Italy and Croatia. www.batteryopera.com tour. think the Lola fits into Vancouver's 'dance award ecology'? what they are in you. AK: Do you have of sense of how you might use it? not sure which part of a career it should support. In any case, it would be cool if it was open to other disciplines. it is designed to acknowledge the whole of a practice. plines are learning to look at dance differently? 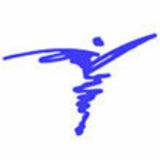 The Dance Centre is BC's primary resource centre for the dance profession and the public. The activities of The Dance Centre are made possible by numerous individuals. Many thanks to our members, volunteers, community peers, board of directors and the public for your ongoing commitment to dance in BC. Your suggestions and feedback are always welcome. The operations of The Dance Centre are supported by the Canada Council for the Arts, the Province of British Columbia through the BC Arts Council, and the City of Vancouver through the Office of Cultural Affairs. performances like the Ring Cycle in Bayreuth have become museum pieces of their own glorious past—rarefied affairs that cost twenty million dollars to produce, and are populated by people who pay upwards of $5000 for a ticket. LSF: Nothing very 'Gesamt' about it.... AK: Considering that dance almost always appears in the context of other disciplines, it is interesting that it isn't more generally valorized as an 'integrated' artform. Can individual works still hold the frame of the Gesamtkunstwerk, or does it apply more to an artist's approach to their entire practice—as it did with Lola? LSF: More to the practice, I think—I can't think of a single work of Lola's that fully embodies the concept, but her entire oeuvre certainly shows evidence of it. AK: Does the idea of a 'total work of art' play a role in your thinking about your own work? costume and environment: An environment that clothes both dancer and viewer, provoking and revealing the interconnectedness of our human bodies so that we may all dance together. The other project is a collaboration with visual artist Edward Poitras and performance artist Robin Poitras, where we are making a “Habitacle” - an as-yet-unknown thing where habitat, habits, clothing (habiller being the french word for to clothe) and spectacle meet. In these projects, I am concerned with the permeability of the body, of the relationship between body and place, body and objects. I want to reveal a body that is in constant negotiation, not just with other bodies, but also between the history it carries and the layers of history beneath its feet. Dance is how we make that negotiation. I am less interested at the moment in choreography as something that I invent on the dancer’s body but something that I do to or with the body of the audience, or to the relationship between artist and the audience. I feel that this is all Gesamtkunstwerk territory. AK: Where will your curiosity take you next? On a rainy Spring day in Vancouver, funneled by a desire for the sun to break through, I reflected on how our season comes to a close, and on future moves and opportunities. Over the past two years, I have been involved in several EU projects which provide support to the development of a new generation of dance makers, and new opportunities for collaboration. Through all these encounters and travels I realize how much Vancouver has evolved since I first came here, and that while austerity measures continue, it is also worth noting that investments into the art continue, albeit differently— channeled towards audience development, collaboration across disciplines and across national borders. Each trip brings more clarity on how The Dance Centre fits into a global context and how we can connect to the world, with projects such as Migrant Bodies, which now makes its way to Italy (May) and to Croatia (June), and will provide Vancouver dance, media and literary artists with an international context to work in, and enable staff to explore different ways of international collaborations. I was pleased to attend Judith Marcuse’s launch of her new project in arts for social change (The Social Sciences and Humanities Research Council of Canada (SSHRC) provided a $2.5 million grant to support the ASC! Project, a five-year, national research initiative on art for social change, the first study of its kind in Canada!). It also reminded me how much effort and time it took her to get to this point. Yet she persisted and kudos are in place and to all who recognize the power of the arts for a healthier community. I look at what we here at The Dance Centre have accomplished: from a small organization in a side street of Vancouver to a world-renowned centre for dance on one of the busiest intersections in town. How what we managed to accomplish together with the many who joined and supported us, we set a standard and put into motion events that just keep on transforming our community. I look at the many partnerships we continue to expand, the numbers of artists whose works we have supported and continue to support. The world reaching out to us, as much as we to them. And, as I look over that list of events past and present, I start looking with more optimism into the future! I am reminded that much of this destiny is in our hands. Hence, as we approach next year’s elections we have to think now what we expect of our governments of tomorrow not only as citizens, but as artists whose role is to contribute to the shaping of the world. Our world. And, this is where the sun comes out. Looking forward to the Summer. offer and how it could work. developing an idea into a larger work. future. CF: Yes, and it's great that there is a whole network, to have AK: How will the new format support this idea? consistency, and to make artists understand why they are chosen in a transparent and supportive relationship. a total pool of eight. out of the series relate to existing Dance Centre programs. the focus of the series, but that is a factor we will have to meet in the selection process. part in the discussions. We want to develop a lineage and a perspective on dialogue and feedback. that be an important aspect of the new series? of interest after a year. As with everything we do, evaluation will be an important part of shaping the new 12 Minutes Max. and the meridians seem related to the tensgrity lines of connection. AK: Will any of this be explained to the audience? AK: After three years of this process, do you find that you have a different body? to in a certain way. Where has it taken you? mystery, and finding a way to access a body that is always there, while constantly changing. body that has different relationship to the world. in the driving idea... KJ: In that sense, yes, I am differently aware, of many AK: Such as? the ground as I had in earlier stages of the research. was interested in some aspect of their practice. AK: Did you dance with them? San Francisco-based Bouffon clown, who, for the entire piece, mocked me as I went through my energy body practice. He was very funny, and I got to see the absurd side of this thingâ&#x20AC;&#x201D;and at the same time feel very strong with in it,. middle of constructing a piece? the breath, and the trumpet. You never leave anything behind: it transforms and changes, but you never break from it. perhaps only four or five in my eightyâ&#x20AC;&#x201C;something works, and that seemed like a natural next step. Things keep coming back, like the vertical axis. I think it is a different kind of process. It is a new adventure. I have never included others in the research process in the way I have in this work. And I haven't used words; usually I don't like using words, but I would like to let people know what is being worked on, on as many levels as possible. AK: What will you do after that and how does it relate to this process? KJ: The process has actually seeped into everything I do. ists who are studying with me in a mentorship relationship. And I have been teaching it in the community engaged context. At the same time, it is challenging when you go back to established dance forms. You never leave anything behind: it transforms and changes, but you never break from it. It is interesting for me to see how often I fall into a form, or a way of moving that I spent so many years in. Still, the process has become so central that I would end up there in any context. It extends range. Every dancer has a favorite way of moving and doing things, and this is a way to expand dance practice. AK: Many thanks! AK: Is there such a thing as a body that is not a slave—is there a free body in dance? been socialized to understand our relationship with each other. The question is: How do you subvert the structure? privileges are and what we are going to do about it, or with it. that's very Christian. Maybe that's 'charity’. art market follow a monetarist model. dance community? Who says that? work and I don’t want to make charming work. AK: Do you find opportunites for dialogue? what will happen; then we can all be vulnerable together. AK: Do you like working in the formal frame of the black box? think of pleasure as an antidote to imperialist structures. the same as what we have or you propose something different.